So our first project for the New Year is to get some guys knitting with our group. In past years, we have always had a few boys who were interested in learning to knit. Many find it interesting from a technical point of view (how does knitting "work", how do you get the yarn to turn into something). For some reason, we've had NO boys this year so far. For the challenge, next week, if another teacher sees a boy knitting in public (during his free time, like recess, or in a class if allowed by the teacher), they will send me an email with the name. Every day, each boy "sighted" gets one entry into a drawing which will be held at the end of the week. The prize will be an iTunes gift card (definitely motivating for guys and girls!). This week they were supposed to see me to pick up knitting needles and yarn and get a lesson if needed. After a day of silence, finally one brave fifth grade boy came in to get supplies. That same day, I had a few more boys ask for needles and yarn. From then it has snowballed! As of today, over FORTY sets of needles and yarn have been given out. We have two advisee groups whose boys have joined in, and today we gave them and one male advisor a knitting lesson. I am really excited by the momentum that's started and can't wait to see if they'll keep it up next week. The project they are working on is a 4" garter stitch square. I tried to give out size 7 needles and cast on from 16-20 stitches (depending on the needle size given). I also knit two rows for them to help them focus on just learning the knit stitch. They are making good progress so far and I'm eager to see how many squares are finished. We will use the squares to make bean bags, which we will donate to the local children's hospital. Here is the bulletin board I created for the project. 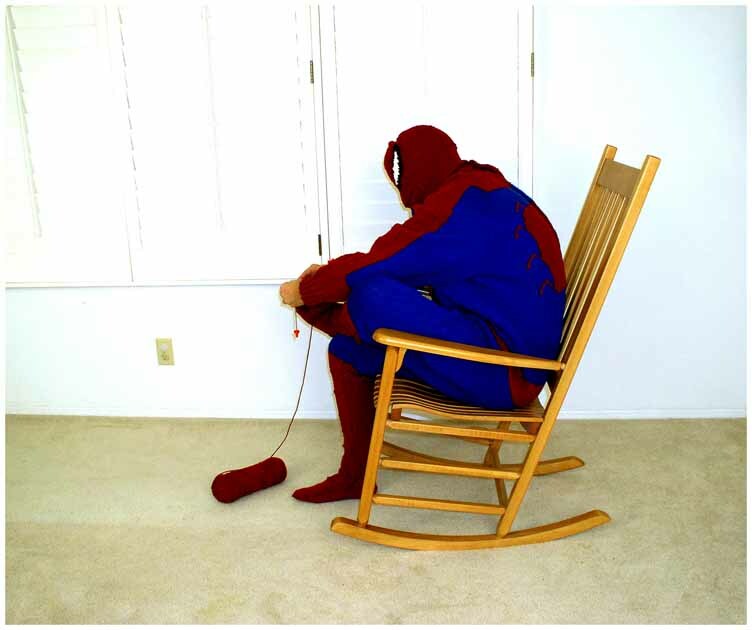 I tried to put up as many pictures of men or boys knitting that I could find, some serious and some humorous, like the artist Mark Newport knitting his Spiderman costume. I also found some easy patterns boys might like to make if they choose to continue knitting. Lastly, I searched for info on celebrity male knitters just to show them cool guys knit too! So far, it seems to be working. Go guys!